Submitted by monicahadley on Fri, 02/15/2008 - 1:37pm. This Friday at 1 pm and Monday at 8 am, Writers' Voices with Monica and Caroline welcomes Mt. Pleasant author and speaker Susan Klopfer. 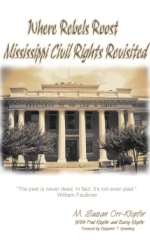 Ms. Klopfer, an award-winning journalist and formerly an acquisitions and development editor for Prentice Hall, is the author of "Where Rebels Roost: Mississippi Civil Rights Revisted," which follows the history of African Americans and their struggle for civil rights in the Mississippi Delta region. Ms. Klopfer's prior publications include "The Emmett Till Book," and a number of computer how-to books. Her speaking topics include "There is a Book Inside You - How to Get It Out" and "How to Market Your Book and Services on the Internet." Join us this week on Writers Voices for another stimulating conversation about books and writing.